An artist’s impression of the distant galaxy SXDF-NB1006-2. Many young bright stars are located in the galaxy and ionise the gas inside and around the galaxy. Green colour indicates the ionised oxygen detected by ALMA, whereas purple shows the distribution of ionised hydrogen detected by the Subaru Telescope. Image credit: NAOJ. 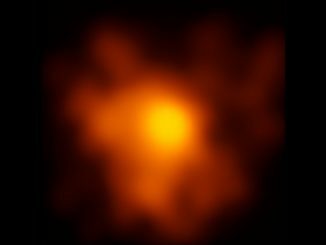 Astronomers from Japan, Sweden, the United Kingdom and ESO have used the Atacama Large Millimetre/submillimetre Array (ALMA) to observe one of the most distant galaxies known. SXDF-NB1006-2 lies at a redshift of 7.2, meaning that we see it only 700 million years after the Big Bang. The team was hoping to find out about the heavy chemical elements present in the galaxy, as they can tell us about the level of star formation, and hence provide clues about the period in the history of the universe known as cosmic reionisation. “Seeking heavy elements in the early universe is an essential approach to explore the star formation activity in that period,” said Akio Inoue of Osaka Sangyo University, Japan, the lead author of the research paper, which is being published in the journal Science. “Studying heavy elements also gives us a hint to understand how the galaxies were formed and what caused the cosmic reionisation,” he added. This diagram (not to scale) depicts the major milestones in the evolution of the universe since the Big Bang, about 13.8 billion years ago. The universe was in a neutral state at 400 thousand years after the Big Bang and remained that way until light from the first generation of stars started to ionise the hydrogen. After several hundred million years, the gas in the universe was completely ionised. Click the graphic for a larger version. Image credit: NAOJ. In the time before objects formed in the universe, it was filled with electrically neutral gas. But when the first objects began to shine, a few hundred million years after the Big Bang, they emitted powerful radiation that started to break up those neutral atoms — to ionise the gas. During this phase — known as cosmic reionisation — the whole universe changed dramatically. But there is much debate about exactly what kind of objects caused the reionisation. Studying the conditions in very distant galaxies can help to answer this question. 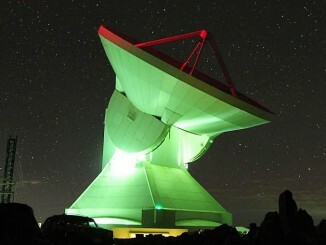 Before observing the distant galaxy, the researchers performed computer simulations to predict how easily they could expect to see evidence of ionised oxygen with ALMA. They also considered observations of similar galaxies that are much closer to Earth, and concluded that the oxygen emission should be detectable, even at vast distances. They then carried out high-sensitivity observations with ALMA and found light from ionised oxygen in SXDF-NB1006-2, making this the most distant unambiguous detection of oxygen ever obtained. It is firm evidence for the presence of oxygen in the early universe, only 700 million years after the Big Bang. 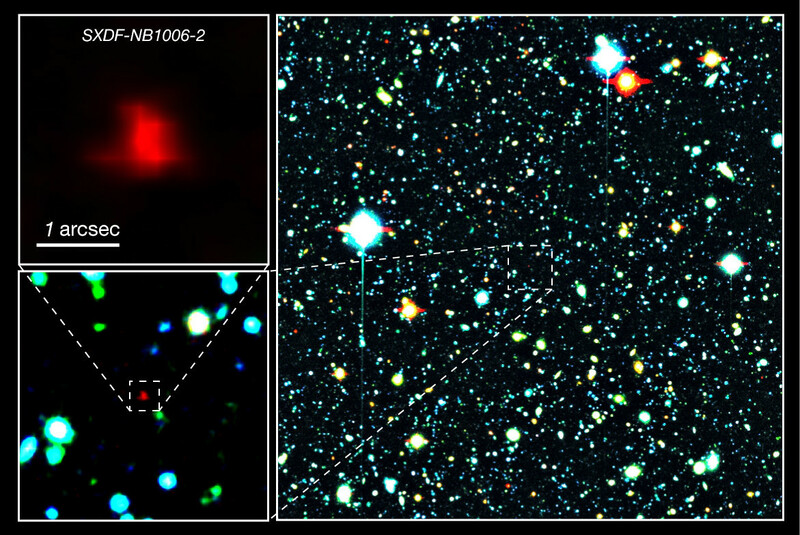 Right panel: The red galaxy at the centre of the image is the very distant galaxy, SXDF-NB1006-2. Left panels: Close-ups of the distant galaxy. Image credit: NAOJ. Light from ionised oxygen detected by ALMA is shown in green. 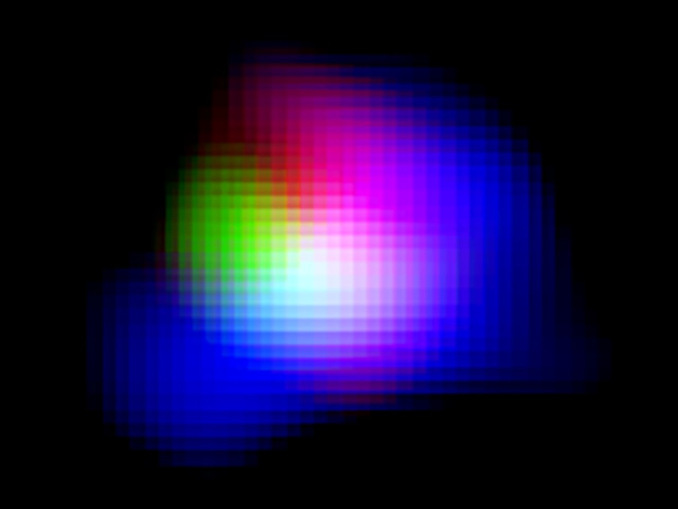 Light from ionised hydrogen detected by the Subaru Telescope and ultraviolet light detected by the UK Infrared Telescope (UKIRT) are shown in blue and red, respectively. 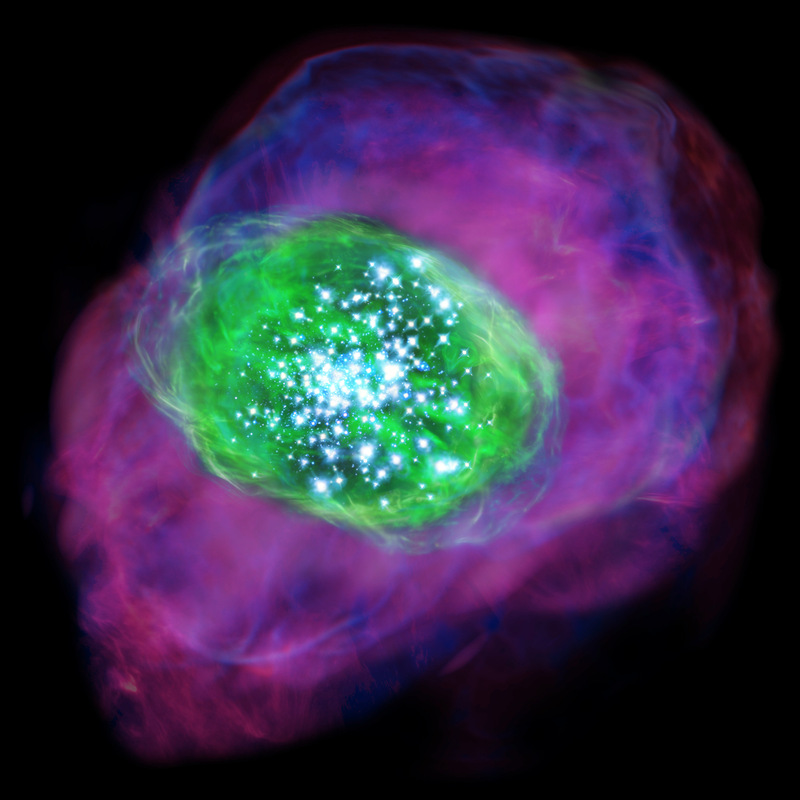 Image credit: ALMA (ESO/NAOJ/NRAO), NAOJ. The detection of ionised oxygen indicates that many very brilliant stars, several dozen times more massive than the Sun, have formed in the galaxy and are emitting the intense ultraviolet light needed to ionise the oxygen atoms. The lack of dust in the galaxy allows the intense ultraviolet light to escape and ionise vast amounts of gas outside the galaxy. “SXDF-NB1006-2 would be a prototype of the light sources responsible for the cosmic reionisation,” said Inoue. Astronomers at the University of Massachusetts, Amherst report that they have observed the most luminous galaxies ever seen in the universe, objects so bright that established descriptors such as “ultra-” and “hyper-luminous” used to describe previously brightest known galaxies don’t even come close. 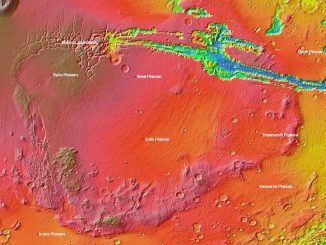 Researchers studying the geography and mineralogy of an area on Mars known as Thaumasia Planum, based on Gamma Ray Spectrometer data collected by the Mars Odyssey Orbiter launched in 2001, have found that the mountain ridge outlining Greater Thaumasia was most likely created by a chain of ancient volcanoes.